"But my Lord, even if I were to write, who would read?" The buffalo reared on his hind legs and took on a preacher's pose. "To work you have the right, my son, but not to the fruits thereof." Then he mooed long and deep for no conch shell he had. With that he disappeared and I woke up from my sleep. Thus having received the word of the Lord, I started a blog in 2008. And on the blog I wrote, I wrote and I wrote. Incessantly I wrote. I wrote humorous narrations of incidents from my life. I shared my views on various topics. I wrote stories; I wrote poetry. I wrote satires and parodies; I wrote tales, fantastical and fanciful, of sense and of nonsense. I was settling into a rhythm of work, life and blog when again Lord Buffalo appeared in my dreams. "What did I tell you to do and what are you doing, my bull calf?" "I am only doing as you advised me, oh Lord. I have been writing all this while." "But is this what I asked you to write?" "How does that matter, oh God? Am I not writing?" "You are, my son. But then a dog is a dog is a dog. And a blog is a blog is a blog. 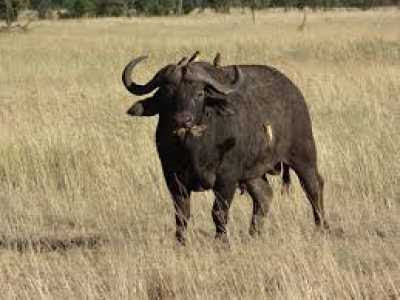 No buffalo should be out on a plain and no story out on a blog. A shed is the right place for a buffalo and a book the right place for a story. That is where stories you must write." Thus saying once again he disappeared." So from then on I devoted myself diligently to get my stories into books. The doors of many an anthology I went knocking. But just four were the ones that were opened unto me in the four years. Dejected and despondent, I sat brooding and dozed away. I was woken up by the feel of something sharp against my posterior. It was Lord Buffalo. Brandishing his horns at me. As soon as I saw him I protested volubly. "No, my Lord. This is not fair. This is just not fair. I have been trying so hard to heed your words. But I have only met with failure at every turn. I am giving up, oh Lord." "What exactly did you do, my little bull calf?" I poured out my entire tale of woe. Of all the anthologies I had gone seeking. Of all the rich and the famous authors' favors I had tried to win in vain. Of all those wasted words that went unread. He listened patiently and then turned his rear end towards me. He let drop a load of dung on to the plain. And then disappeared without a trace.